Join us for the Professional Lunch Series! During this 1 hour session, you will eat and drink while learning from a variety of professionals, some Macaulay Honors College alums and others throughout different industries. Each speaker, brings a new perspective and set of tools to provide advice on the best strategies to follow your path and meet your career goals. They will share stories from their undergraduate experience to their present-day role. You will have the opportunity to ask any questions in this informal discussion. CUNY students are welcomed to attend as well but must bring a CUNY ID and can RSVP here. For this week’s speaker, please see the information below. 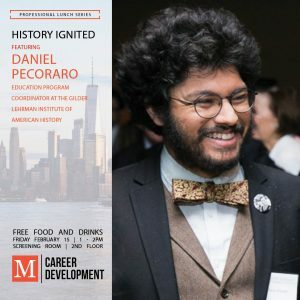 Daniel Pecoraro is an Education Program Coordinator at the Gilder Lehrman Institute of American History. At the Institute, he is responsible for the day-to-day operations of the Affiliate School Program, a network of over 18,000 K-12 schools worldwide, and coordinates monthly offerings to teachers, the Civil War Essay Contest for Grades 6-12, and the Dear George Washington Contest for grades 2-5. In addition, he coordinates the Institute’s internship program for high school and college students, and as part of a team of four coordinates 30+ Gilder Lehrman Teacher Seminars each summer. Prior to joining the Gilder Lehrman Institute staff, he served as School Groups Coordinator and Member and Donor Relations Coordinator at the National Museum of Mathematics, including management of school trip series for Title I schools sponsored by Google, Con Edison, OppenheimerFunds, and Two Sigma Investments. A proud alumnus of the New York City public school system from Kindergarten through a Master’s degree, Daniel earned his BA in History at Macaulay Honors College at Hunter College in 2014 and his MA in History at Hunter in 2017.